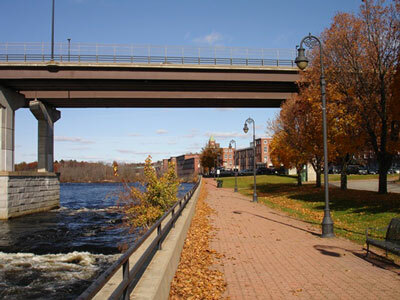 The City of Manchester has dedicated segments along the Merrimack River to the New Hampshire Heritage Trail Network. The Heritage Trail is a trail program run by the State of New Hampshire to provide a link between communities and preserve recreational and historical corridors in New Hampshire. Portions of the Heritage Trail are well-defined and accessible for walking and hiking. Portions of the trail include the Riverwalk in the Manchester Millyard, which is paved and can be used for cycling. The Heritage Trail continues South toward MerchantsAuto.com stadium, where it connects to the "Hands Across the Merrimack" bridge and the Piscataquog Trail. Future phases of the Heritage Trail include developing a paved recreational trail from North to South, adjacent to the railroad corridor and defining the path through the millyard. This trail will allow users from North and South Manchester to access the amenities of downtown Manchester without having to utilize motorized vehicles.